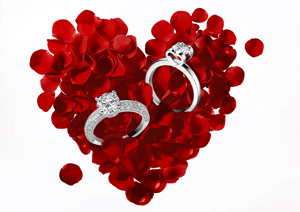 He loves me, she loves me… Listen to the joyful of the heart and celebrate the irresistible happiness of love with Chopard ! Discover a selection of Valentine’s Day gifts for her and for him, to declare your love in the most romantic tender or passionate way. 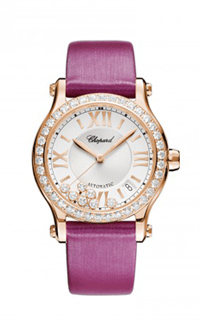 This Happy Sport watch sparkles with femininity. Stunningly crafted from 18-carat rose gold with a diamond-set bezel, its curved lines and daring unconventionality are perfectly Chopard. The silver-toned dial richly accentuates the Roman numerals and finely crafted details, while Chopard’s signature moving diamonds playfully dance in a… joyful display of light. 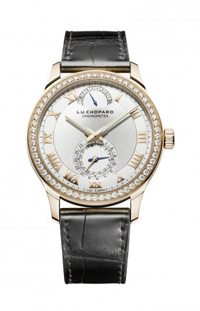 The L.U.C Quattro watch in 18-carat rose gold set with diamonds is a classic yet distinctive model. Beneath its refined silver dial, the 43 mm-diameter case houses the L.U.C Calibre 98.01-L, a tour de force that, despite its extreme finesse, has a 9-day power reserve, thanks to L.U.C Quattro technology. This model is both… chronometer-certified and bears the prestigious Poinçon de Genève quality hallmark.